One of two sets of cameras known as SuperWASP. The batteries hunt for extrasolar planets by looking for transits among millions of stars at a time. Astronomers have struggled for centuries to find our solar system's planets, let alone any outside of our relatively puny cosmic neighborhood. Yet during only the past 13 years, observers have tracked down nearly 300 distant bodies beyond our system thanks to rapid advances in ground-based telescope technology and methods. Ten worldsalone were identified by a group of astronomers in the past six months usingearthbound instruments, and another team of scientists just announced they havefound the youngest-ever planetary infant. The hunt for the first Earth-likeplanet, however, is still on. Observersdiscussed the state of their search for extrasolar planets, as worlds beyondthe solar system are known, during the Royal Astronomical Society's NationalAstronomy Meeting in Belfast, U.K., this week. Extrasolarplanets are tough for telescopes to detect unless the objects are about thesize of Jupiter, which is why astronomers rely on unique methods to find theelusive bodies. Periodicwiggles in stellar movement can signal an orbiting world's gravitational tug onits star. Another method looks for dips in stellar brightness calledtransits ? when planets pass directly in front of a star and block out someof the light. Instead ofspending weeks babysitting single stars to seek out gravitational wiggles, asmany planet-hunters do, some European astronomers are monitoring millions ofstars with inventive camera setups such as one called SuperWASP. ?SuperWASPis now a planet-finding production line," said Don Pollacco, a SuperWASPproject member and a Queen?s University Belfast (QUB) astronomer. In the pastsix months alone, Pollacco said, the project's two batteries of cameras in South Africa and the Canary Islands have pinpointed 10 new planets, for which SuperWASP has alsoestimated size and mass. "[It] willrevolutionize the detection of large planets and our understanding of how theywere formed," Pollacco said of the new planet-hunting program. "It?sa great triumph for European astronomers.? In additionto the 10 new extrasolar recruits ? the comprehensive exoplanet count now totals277 ? another group of astronomers said they've located an embryonic staryounger than any seen before with the Very Large Array of radio telescopes in New Mexico. ?The newobject, designated HL Tau b, is the youngest planetary object ever seen,"said Anita Richards, an astronomer at the U.K. Jodrell Bank Centre forAstrophysics. Richards,who worked with Greaves' team to describe the infant planet, said it's just 1percent as old as the young planet found inorbit around the star TW Hydrae last year. "Wesee a distinct orbiting ball of gas and dust, which is exactly how a very youngprotoplanet should look," Greaves said, noting the far-younger planetshould take on a Jupiter-like essence in millions of years. Althoughastronomers are developing large, space-basedprojects to hunt for Earth-like planets ? such as the Jet Propulsion Lab'sproposed Terrestrial Planet Finder ? ground-based observers aren't sitting idlyby. 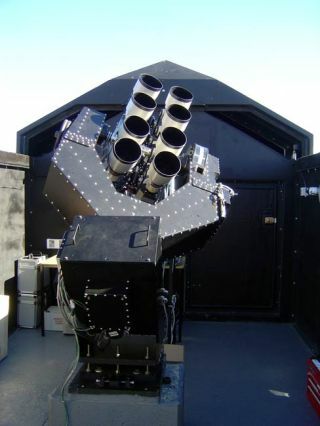 In hopes offinding small rocky planets, some U.K. astronomers are using a special cameraknown as "RISE" that is mounted onto the Liverpool Telescope in England. The device rapidly photographs a portion of the sky and compares the brightness ofstars and large extrasolar planets from image to image. If there's any dimming, said Neale Gibson, also a QUB astronomer, the instrument willfind it and reveal if small rocky planets are disturbing the orbits of hot,gassy planets. "RISEwill allow us to observe and time the transits of extrasolar planets veryaccurately," Gibson said. "If Earth-mass planets are present innearby orbits ? we will see their effect on the orbit of the larger transitingplanets. ?